The advanced cosmetic treatments available at Rejuvena Cosmetic Medical Center provide a path to effective, natural-looking rejuvenation without incisions, sutures or downtime. Led by experienced physician Joan Hardt, M.D., we specialize in non-surgical treatments that safely and effectively restore your youthful beauty and confidence in your appearance. 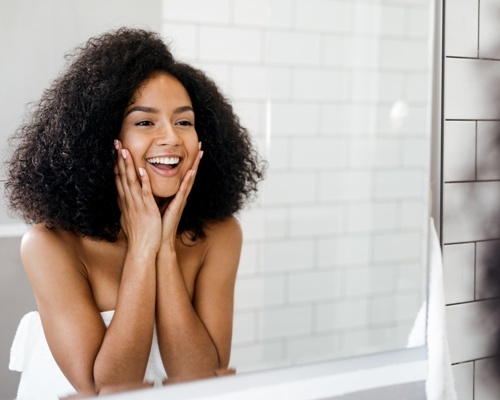 Wrinkles, sagging skin, depleted facial volume and other signs of aging can affect your self-esteem and in turn, your confidence in personal and professional interactions. Dr. Hardt offers a variety of cosmetic injectable treatments to lift and sculpt the face, restore lost volume and produce a more youthful and natural appearance without the need for costly and invasive surgery. When you feel refreshed and vibrant, the real you can more easily shine through. To learn how Dr. Hardt can help you achieve your aesthetic goals with cosmetic injectable treatments, please call Cosmetic Medical Center today at 405-842-1100 to book a complimentary consultation. We help men and women from across the country and throughout Oklahoma, including Oklahoma City, Norman and Edmond. Why Choose Joan Hardt, M.D. for Your Cosmetic Injectable Treatment? Botox® Cosmetic injections are among the most popular facial rejuvenation treatments in the United States, providing millions of men and women with lifted, tighter and more youthful appearances. Xeomin is a popular alternative to BOTOX® Cosmetic that utilizes a similar method of minimizing the appearance of facial lines and wrinkles. Unlike dermal fillers that replace lost volume, BOTOX® Cosmetic and Xeomin temporarily interrupt the nerve signals that cause muscles to tense, producing a soft and smooth facial appearance that can last for several months. These quick and easy procedures can be completed on your lunch break, allowing you to return immediately to all of your normal activities. To find out which Juvederm product is right for you, contact Rejuvena Cosmetic Medical Center today to schedule a consultation with Dr. Hardt. She will listen to your goals, evaluate your condition and recommend the treatment that is best for you. Dr. Hardt is one of the few physicians in the country to be given "Platinum Plus" and “Top 500” status by Allergan, the makers of BOTOX® Cosmetic and JUVEDERM®. Kybella® is a specialized injectable treatment, approved by the FDA as a safe and effective method for getting rid of a double chin. An ideal alternative to invasive facial surgery, the Kybella formula is simply injected into the targeted area and your unwanted fat gradually melts away over time. Radiesse® is an ideal option for total facial contouring. It differs from products like Belotero and Juvederm in that it is not a hyaluronic acid filler. The Radiesse formula comprises a smooth gel containing calcium hydroxylapatite (CaHA) microspheres. It can enhance your existing features, restore your vibrant, youthful appearance and increase your confidence. Radiesse adds volume in targeted areas and continues to work by stimulating your body’s collagen production. Once the Radiesse injection is absorbed by the body, your natural collagen will continues to provide an elegant, natural-looking appearance. Radiesse results have been clinically-proven to last a year or more for many patients. It provides an immediate increase in volume and wrinkle smoothing. It can also restore or create fuller lips with greater definition and volume. Belotero® is a hyaluronic acid-based dermal filler that plumps and rehydrates the skin to even-out wrinkles and creases and improve facial contours. Belotero is able to add volume by binding with water beneath the skin, filling in fine lines and deep wrinkles alike. About half of the body's’ natural hyaluronic acid is located in the skin - in both the epidermal and deep dermal layers. By attracting and holding moisture, hyaluronic acid volumizes the skin and produces a soft and youthful appearance. As we age, the natural production of this acid diminishes, and the skin gradually sinks and wrinkles. Belotero addresses these issues by restoring hyaluronic acid levels and encouraging volumization. Check our current specials to see if your favorite treatment is available! Sculptra® is not a wrinkle filler; it is a bio-activator, or volumizer. It works by stimulating the body’s production of new collagen, replacing lost volume and restoring a fuller, more youthful appearance. Sculptra contains poly L lactic acid (PLLA), a synthetic, biodegradable polymer that is both resorbable and compatible with the body. PLLA’s bio-compatibility is proven, and has been used for many years in dissolvable sutures. As we age, our faces don’t so much ‘fall’ with time; they lose volume and deflate. This deflation and volume loss leaves us looking older. By restoring lost volume, Sculptra can ‘lift’ drooping skin and restore symmetry. Sculptra is used to restore volume to hollow areas of the chin, cheeks, temples and under the eyes. It can also improve jaw line definition. Bellafill® is unlike other common dermal fillers because it is considered semi-permanent. The ability of most dermal fillers to correct volume loss is temporary. Some products last longer than others, but gradually, they are eventually metabolized by the body. In some cases, these temporary results are a benefit, because if you don’t really like your results, they will naturally revert to normal after a period of time. Temporary injections also allow you to feel comfortable with your results before committing to longer-lasting or permanent alternatives. Of course, the downside of temporary correction is the necessity of repeated injections to maintain your results. With Bellafill, the need for maintenance injections is greatly reduced. Bellafill is used to treat nasolabial folds, build up cheek bones and define the chin and lower jaw. It contains microscopic spheres of a typically non-reactive synthetic substance and is combined with collagen for easy injection into targeted areas. Because a small number of patients may experience an allergic reaction to the collagen in Bellafill, skin tests are conducted before treatment to ensure a positive experience. Platelet Rich Plasma (PRP) therapy is an innovative approach to rejuvenating your skin by harnessing the natural healing and regenerative properties of your own body. PRP is harvested from your blood with a normal blood draw. The PRP is then isolated and prepared for injection. To determine if PRP treatment is right for you, schedule a consultation with Dr. Hardt. She will evaluate your condition and explain all of your treatment options. In some cases, PRP therapy alone can deliver the results you want. In other situations, Dr. Hardt my recommend a combination of treatments to achieve your goals. We offer CareCredit financing to help patients achieve their beauty goals without a financial burden. Many patients want to achieve the transformative results of a facelift, but want to avoid the cost, pain and lengthy recovery period of a surgical procedure. A liquid facelift is an ideal alternative to plastic surgery. Liquid facelifts involve a combination of injectable treatments to help you achieve a refreshed, restored, rejuvenated facial appearance without the use of incisions, sutures or downtime. Just like our patients, no two faces or aesthetic goals are the same. When your cosmetic objectives cannot be achieved with a single dermal filler, Dr. Hardt will recommend a customized treatment plan designed specifically for you. Dr. Hardt has been given "Platinum Plus" and “Top 500” status by Allergan, the makers of BOTOX® Cosmetic and JUVEDERM®. This distinction punctuates her extensive experience with cosmetic injectables and her unwavering dedication to helping her patients look and feel their absolute best. During your initial visit, Dr. Hardt will spend time with you to discuss your goals and determine the best options for your needs, lifestyle and budget. She will develop a customized treatment plan tailored just for you. If you would like to learn more about the injectable treatments available at Rejuvena Cosmetic Medical Center, please call us today at 405-842-1100 or complete the form on this page to schedule a free consultation. We proudly serve all of Oklahoma, including Oklahoma City, Norman and Edmond, and welcome patients from across the country.